July brings us beans, burgers and the best of food festival fun. Season’s Eatings – what foods are in season for July? Last month I was lucky enough to dine in two very different restaurants – upmarket The Treehouse at Alnwick Gardens in Northumberland and ‘down n dirty’ burger and ribs joint, Red’s True Barbecue in Leeds. The Treehouse certainly lived up to its name and followed the treehouse theme through well both inside and out. Set in the beautiful Alnwick Gardens and complete with rope bridges and fairy lights it felt really special. The menu was quite limited and it wasn’t the most family friendly place (considering it’s set in one of the region’s most popular tourist attractions) but the quality was very good. Nice experience but perhaps not one we’d rush back to. Red’s True Barbecue on the other hand was quite different – very relaxed, big menu (as long as you like meat!) and very bustling. They have gone with a theme as well – taking ‘holy smoke’ to mean an evangelical love of smokehouse meat – and have applied it consistently throughout the brand, the interior and the menu. 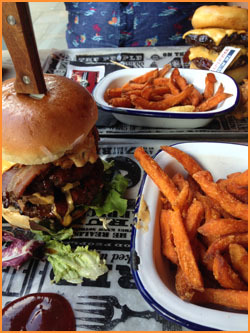 The food was very naughty, very meaty and very nice plus they had a few twists on the traditional burger and ribs including the Doughnut Burger you can see in the background on the main image (yes really – doughnut instead of bun!) and the belly busting Pit Burger which pretty much had a bit of everyt hing! 1 Response to "The 3Style Foodie Blog – July"